My sweet hens were laying so well at the tail end of winter. Every girl came through with a fresh egg come snow or sunshine. Once we entered a thaw, enough that the ladies could take a stroll around the property again, the eggs stopped. Or so I thought. I was perfectly fine with the interruption. Why shouldn't the girls have a spring break of their own? We spent our period of eggus interruptus tending to our garden plots. I'd till and the ladies would nibble at critters and weeds alike. One afternoon, while playing in the dirt, I took a break to peek into the corn crib to see if I had an extra trowel hiding away. Who did I see? Lonely Girl. She was nestled in a hay lined animal carrier. I keep a few crates for any sick farm creatures that need transport to the vet. Here was my most anti-social chicken, trying to enjoy some privacy. As it turns out, she wasn't the only one. I nudged my compliant feathered friend to take a peek and it seems that all the girls had been hopping up to the penthouse nest to get their egg on in peace. What to do with this unexpected bounty? Quiche, of course. And with my asparagus starting to emerge and the wild onion growing, well, wild, I couldn't think of a better way to make a meal of all the glorious largess offered by nature. A crisp and buttery gluten-free crust keeps the deliciously smooth custard in check. This crust is adapted from my new book Let Them Eat Cake: Classic, Decadent Desserts with Vegan, Gluten-Free & Healthy Variations. For a host of recipes that have you covered for ANY dietary situation, check it out! In the bowl of a food processor, combine the flour GF flour blend, xanthan, sugar and salt. Pulse to combine. Open the processor and place the butter evenly on top of the flour mixture. Close the processor back up and pulse a few times until the mixture resembles very coarse cornmeal. Stir together the water and lemon juice and slowly pour the water into the processor while pulsing until the dough just comes together when you pinch a bit between your fingers. Turn the dough out onto a large piece of plastic wrap and turn the dough over a few times to get rid of any dry flour spots. Press the dough into a rough round and cover completely. Refrigerate for 20 minutes. Preheat the oven to 375ºF. Spray a 9 - 9 1/2 " inch round, 2" tall pie or tart pan with non-stick cooking spray (a deep dish pie plate works well). Break the dough into small pieces and press in an even layer along the bottom and sides of the tart pan. Dock the bottom of the dough and freeze for 20 minutes. Line the tart pan with parchment paper and fill to the very top edge with pie weights or dried beans (or rice). Place the tart pan on a parchment lined sheet pan and bake for 20 minutes or until the top edge of the crust is golden brown. Remove the weights and parchment and bake until the bottom of the crust just starts to turn golden, about 15-20 minutes. Set aside to make the filling. In a large bowl, whisk together the eggs, creme fraiche, heavy cream, garlic powder, nutmeg and white pepper until smooth. Stir in the gruyere, ham, red pepper, chives and asparagus. Gruyere is a very salty cheese. Add just a bit more salt to season. Put the parchment lined sheet pan with the tart shell back in the oven. Carefully pour the filling into the tart shell and lower the oven temperature to 350ºF. Bake for 45 minutes to an hour or until the quiche filling puffs up and shimmies only slightly in the middle. Take from the oven and allow to about 20 minutes before serving. 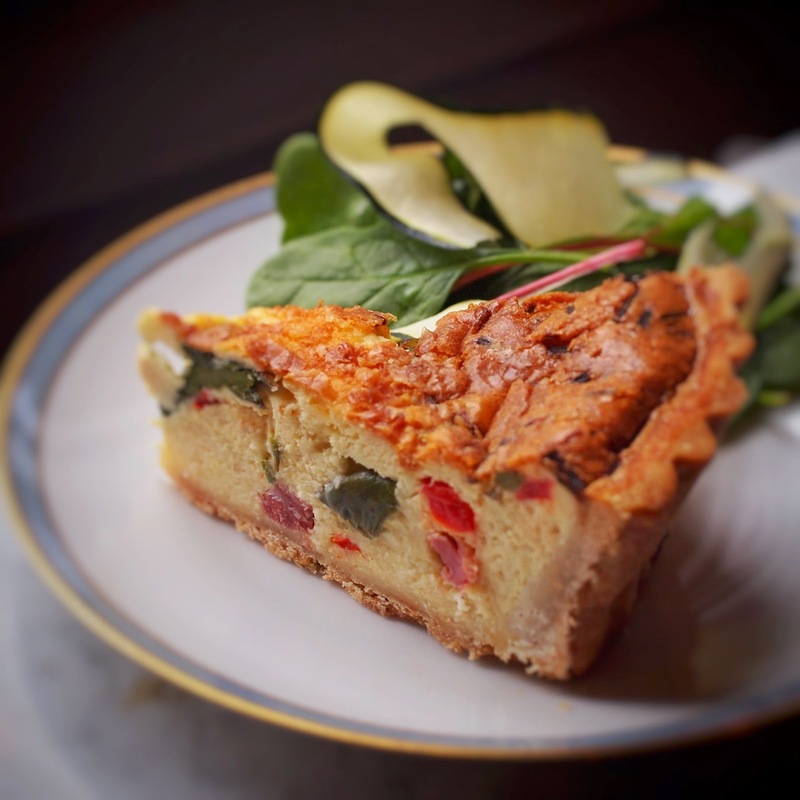 The quiche is also wonderful served cold.